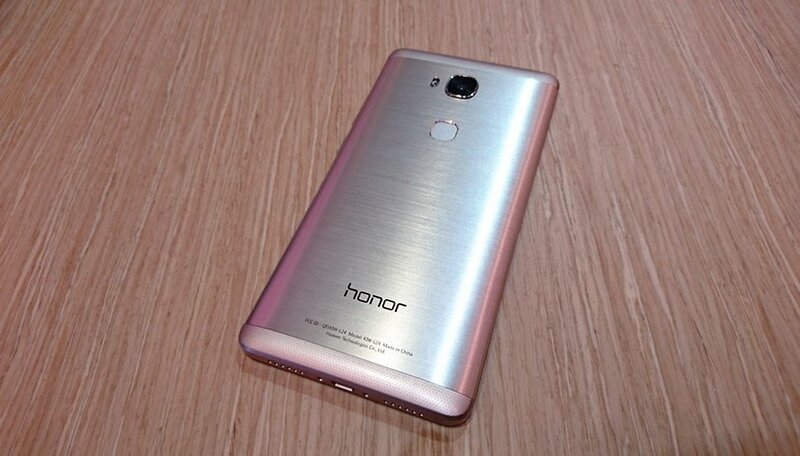 Honor is heading to the US and it's bringing its new phone, the Honor 5X, with it. This sub-US$200 smartphone is already hitting all the right notes and looks set to become one of the best budget Android phones around. And that's not all – this budget wonder is comparable to the iPhone 6s, and in our eyes, could be the better choice of the two. One of the great things about the latest iPhone is its design. It's made from luxurious glass and metal device and that's part of the reason why it's so popular with consumers. Surely the Honor 5X can't compete in this area? Actually, it can. The Honor 5X follows a recent Huawei/Honor tradition of furnishing a low-cost phone with high-quality looks and feel, and yes, it too is made of glass and metal. And not just metal – sultry, curved, brushed metal at that. Every bit as nice as the iPhone. If you were going to base a smartphone purchase on the best looks for the price, the Honor 5X would have to be high on the list of contenders. Groundbreaking specs aren't ever Apple's goal for its iPhones, and even average Android smartphones appear better on paper. But some aspects of the Honor 5X are similar, and others are undeniably more impressive. Raw display resolution is better on the Honor 5X, which has a 1,920 x 1,080 display and 401 pixels-per-inch (ppi), compared with the iPhone 6s's 1,334 x 750 pixels and 326 ppi. Honor's screen-to-body ratio is better too – at around 72 percent compared with the iPhone 6s' 65 percent. I can't think of a reason why you wouldn't want that. The Honor 5X also has a 13 MP rear camera compared with the 12 MP sensor on the iPhone 6s, and the same 5MP shooter on the front. Both phones have the same amount of RAM (2GB), but the Honor 5X houses a quad-core processor while the iPhone's chip is dual-core. The Honor 5X also supports microSD cards – a big selling point for some consumers. This doesn't necessarily mean that the Honor 5X will perform better: we know iPhones do incredibly well in image processing and usability and Apple rolls out updates far more quickly than Android manufacturers can. Honor, admittedly, doesn't have the best history of issuing updates. But maybe it’s not all that important. Updates come around eventually, and are rarely the most biggest factor in a purchasing decision. Performance does matters and there will likely be a difference. But a significant difference? Maybe not. Honor has some genuinely useful battery functionality, and when combined with Marshmallow, its battery life could be great. iPhone battery life isn’t inherently superior to Android's – it has to be measured on a case by case basis. Given the Honor 5X’s higher battery capacity (3,000 mAh) and advanced battery features, when it gets combined with Doze its lifespan could be superior. And if we know anything about phones it's that battery life matters. Apple products are expensive because Apple decided they are expensive: not because they are necessarily great. An Apple Watch can cost up to US$17,000 and whether or not its worth the value that Apple has placed on it is up to the consumer to decide. We can’t say too much about the Honor 5X until we’ve thoroughly put it through its paces, but don’t be fooled by Apple’s very clever branding and marketing. These devices are comparable on paper. Some of the iPhones's finer details might sway you, but these are both smartphones. When all is said and done, they do essentially the same thing. We're going to compare them side-by-side when we get our hands on the Honor 5X but, honestly, I'd be stunned if I see an extra US$449 worth of value in what the iPhone 6s offers. There's no chance. That's where I stand, but what about you? Let me know your thoughts in the comments. I love this phone...a plus side is the FM radio tool already with the phone. It looks like a hybrid between a IPHONE and ANDROID look...but ANDROID system. It's sleek look is great. It's convenient to have ANDROID pay secured with your fingerprint. I like seeing someone else mention that Apple prices are arbitrarily high and do not indicate quality or capability. Case in point: I have a Droid Turbo and girlfriend has an I-Phone 6, the Verizon sales tech said mine was actually a better machine and the months since then have proved this out. Girlfriend wants to exchange her I-Phone for a Droid Turbo, even at a loss. I pre-ordered it but just saw it didn't have NFC. I think that is a deal breaker for me! May cancel order. it's probably just me, but I can kinda feel some bias here.. Ya.... I mean comparing the apple soc and an android one is not really a spec for spec comparison. Same for Ram. The only dual core comment is a bit misleading. The gpu has another zillion cores that the OS leverages. I'm not fanboying this comment. I have a Nexus 6p and a oneplus X.
FYI - The Honor 5X has been released with Lollipop, not Marshmallow. No Doze feature, at least not yet.